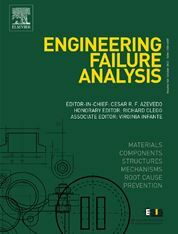 Engineering Failure Analysis publishes research papers describing the analysis of engineering failures and related studies. Papers relating to the structure, properties and behaviour of engineering materials are encouraged, particularly those which also involve the detailed application of materials parameters to problems in engineering structures, components and design. In addition to the area of materials engineering, the interacting fields of mechanical, manufacturing, aeronautical, civil, chemical, corrosion and design engineering are considered relevant. Activity should be directed at analysing engineering failures and carrying out research to help reduce the incidences of failures and to extend the operating horizons of engineering materials. Emphasis is placed on the mechanical properties of materials and their behaviour when influenced by structure, process and environment. Metallic, polymeric, ceramic and natural materials are all included and the application of these materials to real engineering situations should be emphasised. The use of a case-study based approach is also encouraged. Engineering Failure Analysis provides essential reference material and critical feedback into the design process thereby contributing to the prevention of engineering failures in the future. All submissions will be subject to peer review from leading experts in the field.